On January 13, 2012, it came to the attention of the Editorial Board of the Saudi Journal of Anesthesia that the journal had published a fraudulent manuscript. The article described a study performed by Drs. Jaydev Dave and Sandip Vaghela, from the MP Shah Medical College, in Jamnagar, India, assessing the effects of dexmedetomidine and propofol in children undergoing magnetic resonance imaging (MRI) scanning. [Table 1] shows the demographic table from the article. The data reported by Drs. 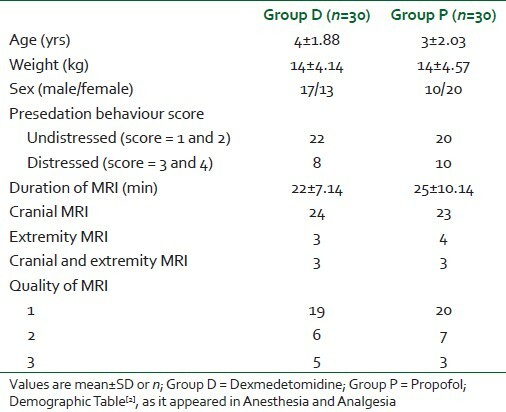 Dave and Vaghela are identical to those from a 2006 manuscript in Anesthesia and Analgesia with an identical title by Koroglu and colleagues  [Table 2]. Drs. Jaydev Dave and Sandip Vaghela claimed to have performed a study at the MP Shah Medical College, which they did not perform. This is more than simple plagiarism. Plagiarism is the use of another author's words or ideas without attribution. Describing a clinical study that the authors did not perform is fraud. It is no different from fabricating data. The manuscript by Drs. Jaydev Dave and Sandip Vaghela has been retracted for plagiarism and fraud. We have reviewed the handling of this submission to the Saudi Journal of Anesthesia. The article underwent plagiarism checking using a free web site service. Unfortunately, minor changes by the authors permitted it to pass plagiarism screening. Anesthesia and Analgesia uses Cross Check from iThenticate. Based on our experience, it is likely that the Cross Check would have caught the plagiarism. The article subsequently underwent a peer review. The reviewers supported publication with revision. After typical cycles of revision, response, and re-review, the manuscript was accepted and published. This is the latest installment in the ongoing saga of misconduct from the MP Shah Medical College. In 2009, Vandana Trivedi, one of the only two Professors of Anesthesia at the MP Shah Medical College,  submitted five manuscripts to Anesthesia and Analgesia. Four of these submissions were rejected for egregious plagiarism: (1) Impact of Anesthesia on Global Warming, Greenhouse Effects and its Prevention, (2) Continuous Suprascapular Nerve Block for Major Scapula Surgery - As a Sole Anesthetic and Postoperative Analgesic: A Novel Better Alternative to G/A: A Case Report, (3) Continuous Maxillary Nerve Block for Maxillary Sinusotomy and Septoplasty - A Useful Technique for High Risk Patients - A Case Report, and (4) Complementary and Alternative Medicine (CAM) for Chronic Pain - An Overview. Dr. Trivedi's fifth manuscript, Clinical Evaluation of Glossopharyngeal Nerve Block for Pre-emptive Analgesia after Tonsillectomy (A Study of 50 Cases), was different. Like Drs. Dave and Vaghela, in her fifth submission, Dr. Trivedi reported data previously published by other investigators as her own. It was rejected for fraud. Attempts to bring this misconduct to the attention of the MP Shah Medical College failed. Professor Trivedi stopped returning E-mails, and efforts to identify and contact the senior faculty of the MP Shah Medical College were unsuccessful. "This article was retracted by the publisher due to inconsistencies with data management, lack of IRB approval, lack of patient consents, involvement of at least one child without parental consent, and other less severe concerns." Last year evidence of repeated fraud, plagiarism, studying patients without informed consent, and at least one case of including a child in a study of adult patients was brought to the attention of Professor Vikas Sinha, Dean of the MP Shah Medical College. In response to these concerns, Professor Trivedi was removed from the academic council of the MP Shah Medical College for six months, and instructed not to use the MP Shah Medical College name in any publication for six months. Research fraud is a serious offense requiring commensurate disciplinary action. We believe the six-month sanction by MP Shah Medical College was not commensurate with the author's misconduct. In response to this recent case of fraud, Dr. Dave has been banned for five years from publication or presentation. Our understanding is that this same sanction has been applied to Dr. Trivedi. These sanctions have only been applied after we brought these cases to the attention of the Society for Scientific Values. The disciplinary action taken (sanctions against future publications) suggests to us that the faculty at MP Shah Medical College can engage in fraud without placing their academic careers at risk. An institution that tolerates fraud, jeopardizes the integrity of the scientific literature, the well-being of their patients, and imposes a considerable burden on the editors and readers, to separate the fraudulent submissions from the honest ones. How should journals respond when an institution does not firmly address repeated academic misconduct? We do not know. The existing guidelines address how journals should handle fraudulent manuscripts if institutions fail to investigate. ** These guidelines do not discuss how editors should respond to repeated misconduct from an institution. This is terra incognita. We considered banning all submissions from the MP Shah Medical College. There is ample precedent for applying sanctions to an entire institution. However, based on feedback from members of the World Association of Medical Editors, we have decided against a ban on all articles from the MP Shah Medical College. Instead, we have expressed our concerns to the Indian Council of Medical Research and the Medical Council of India, and await their reply. 1. Jaydev D, Sandip V. A comparison of the sedative, hemodynamic, and respiratory effects of dexmedetomidine and propofol in children undergoing magnetic resonance imaging. Saudi J Anaesth 2011;5:295-99. 4. Lam PK, Wei WI. Medialisation thyroplasty for unilateral vocal fold paralysis associated with chronic pulmonary tuberculosis. Hong Kong Med J 2007;13:327-9. 6. Rosen CA, Anderson D, Murray T. Evaluating hoarseness: Keeping your patient's voice healthy. Am Fam Physician 1998;57:2775-82. 7. Erratum. Indian J Anaesth 2011;55:121.